Review: Revolt. She Said. Revolt Again. Revolt. She Said. Revolt Again., directed by Rowan Wishart, was a passionate (and quite often eclectic) construction of modern life as a confined woman. The play was altogether terrifying and hilarious—encapsulating the bizarre while remaining remarkably familiar. From the moment of walking into the Barron, it is clear that Revolt is not an average St. Andrews play. Plastic wrap covers the walls, hundreds of rose petals hang from the ceiling on string, and the audience is wrapped around the stage. The set design (Grace Cowie) was creative, refreshing, and hugely effective throughout the play, as a dynamic space to add to the storytelling. The show is a compilation of scenes depicting women demanding respect—first in the bedroom, then in her relationship, then in her workplace. From here, the play takes a dramatic turn towards the fantastically absurd. A woman enters the stage who has seemingly gone mad reciting a story of a mental breakdown she endured in the middle of a grocery shop. In what was one of the most powerful images of the show, the “mad” woman (played by Molly Williams) takes a pair of scissors and cuts through the plastic wrap around her waist, tears off her eyelashes, and wipes the makeup from her face. What follows are snippets of stories—a loud carnival salesman shouting, a twelve-year old bride forced to walk up the altar, a man trying to remember how to describe another woman, a woman throwing up thousands of rose petals…The play leaves the audience exhausted, with the bizarre plotlines that function as if they are in a whirlwind. Finally ending with the four actresses standing in black at the top of the stage, firmly calling for a revolution against men. I will admit that after the curtain call, I hadn’t quite processed the performance yet. We were all left a little struck, a little confused, and very emotional. The play kept the audience constantly engaged and constantly looking for logic. This, I think, was the beauty of it. In the same way that society doesn’t seem to make sense most of the time, that gender inequality seems unfathomable but also familiar, Revolt made a mess of everything normal and made the normal seem bizarre. 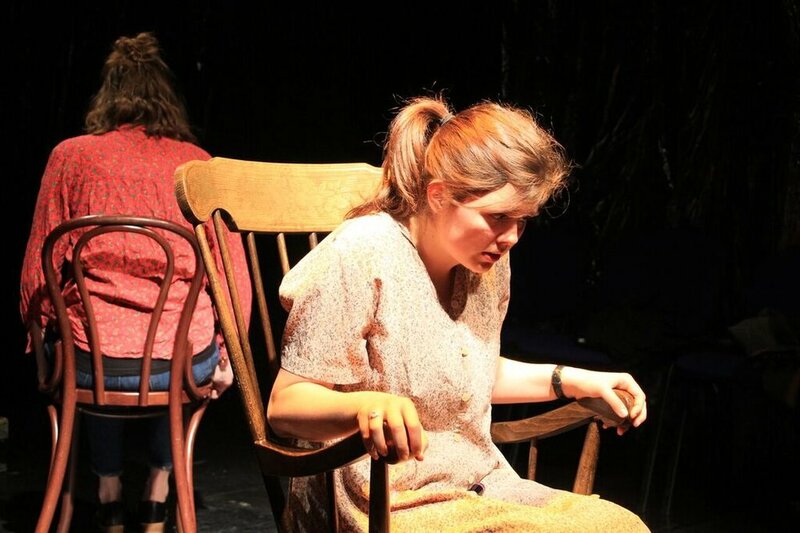 Particularly moving performances came from Sarah Chamberlain and Molly Williams in their powerful presence throughout the show. Additionally, the lighting design (Grace Cowie) worked incredibly well with the set, and all the technical aspects of the performance should be applauded for a fantastic and creative use of space. If I were to criticise any aspect of the show, it would be that most of the direction was still focused out to the centre audience without much performed to the side audiences. With such an interesting setup for the stage, it seemed odd to me that the action wasn’t more dynamic and involved with the entire audience. Overall, Revolt. She Said. Revolt Again. was brilliantly performed. I truly respect the creativity and boldness demonstrated, and there was great talent displayed from all sides of the production.